The financial industry is laden with jargon that’s hard to understand for people who work in other areas. Annuities and IRAs fall squarely into that category of being difficult to compare when it comes to fees, expenses, returns, pros and cons. What’s the difference between a traditional IRA vs Roth IRA vs 401(k)? How do you choose between an annuity vs IRA account? 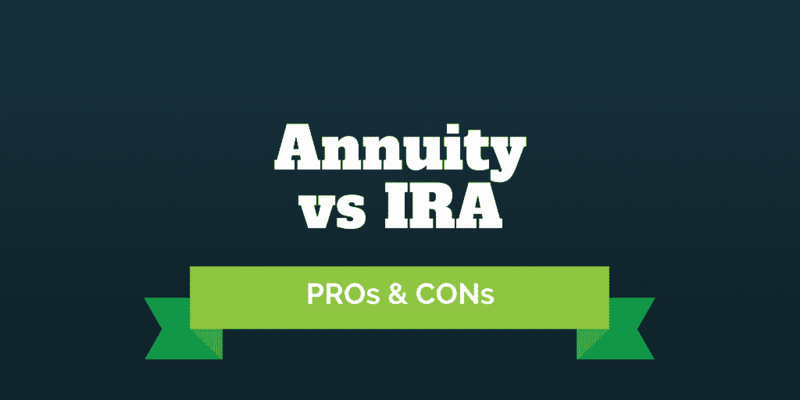 It’s all quite complicated at first glance, which is why we broke it down and made it easy so you can quickly gauge annuity vs IRA differences in order to give yourself the best chance at a more comfortable retirement. What Is An Annuity Account And How Do Annuities Work? And How Do Annuities Work? An annuity is a financial product issued by an insurance company that pays a guaranteed fixed income amount on a regular basis, typically each month or quarter. Step 1: You fork over a lump sum all at once or you make regular contributions over time. Step 2: The insurance company then invests those premiums and gambles that it can earn more money from its investments than it commits to pay you. Annuities come in various shapes and sizes. You could choose to be paid a fixed income stream for the rest of your life, a set time period, or a fixed number of years. Below we’ll compare fixed annuities vs variable annuities vs equity-indexed annuities. An IRA or Individual Retirement Account is nothing more than a type of account set up at a brokerage firm or some other financial company. Different types of IRA accounts exist, including traditional IRA, Roth IRA, and SEP IRA accounts. The main attraction of an IRA is that contributions grow tax-deferred. That means if you invest in stocks, bonds, mutual funds, or other asset classes, your gains are not subject to taxes while the money remains in the accounts. It is not until you withdraw money from a traditional IRA that you pay taxes however you never have to pay taxes on gains from a Roth IRA. You might be wondering then why not put all your money into a Roth IRA if gains are never taxed? The catch is your contributions to a Roth IRA are made with after-tax money while your contributions to a traditional IRA are made with pre-tax money. Even if you wanted to put all your money into a particular IRA account, contribution limits are in place so you can’t deposit more than a certain amount. And the withdrawal rules for IRAs and Roth IRAs may vary too, so it’s worth checking them before picking one retirement account over the other. >> What Are The Rules For Roth IRA Withdrawals? Keep in mind that any traditional IRA withdrawals you make before the age of 59.5 years old will be penalized and you must take mandatory withdrawals by age 70.5 if you haven’t already done so. For Roth IRA accounts, you must take minimum withdrawals by the age of 70.5. Depending on three primary factors, you will probably find yourself naturally leaning more towards either an annuity or IRA account. Control, fees, and certainty are the biggest considerations when choosing between an IRA and an annuity. If you are a self-directed investor who actively manages a portfolio in a brokerage account at say TD Ameritrade or thinkorswim, an IRA will probably be a better fit for you. In an IRA, you have control over how to invest your money. Want to bet it all on Amazon, Facebook, Google, or Netflix? You can and nobody will stop you – however, it may not be the wisest way to allocate your retirement money! For retirement-focused individuals who want to offload the responsibility of managing money, an annuity may be more attractive because the responsibility of the insurance company is to invest your contributions. What makes fixed annuities attractive is the insurance company guarantees you a fixed payout irrespective of how your investments perform. So, if the stock market crashes, you still receive your fixed income payment. Equally, if the stock market soars, you don’t receive more than the specific amount the insurance company agreed to pay you when you selected your annuity. The bet the insurer makes is that they will earn more on the investments than they commit to paying out to you. The certainty of a fixed income stream for a defined time period promised by insurance companies when you select an annuity comes at a cost. Annuities are famous for their lack of fee transparency, so it is always best to ask an insurance company for a full breakdown of all fees associated with the annuity. If you have a financial advisor, ask them how much they get paid. You might be surprised to discover financial advisors often get paid a hefty fee for referring customers who purchase annuities to insurance companies. A 5% fee paid to a financial advisor may not seem like a massive amount until you figure that could be $50,000 on a $1,000,000 annuity sale! Although annuity fees can be hefty, the peace of mind they bring may be worth the upfront cost to many retirees. If you are worried about outliving your nest-egg or running out of money, an annuity can bring certainty that you will always receive a fixed income. Annuities come in all sorts of shapes and sizes too. You could pick one that pays you until you die or both you and your spouse die. And you can choose from different types of annuities to ensure that your kids or other beneficiaries receive payments from any unpaid funds via a death benefit. Beyond fees, the biggest reason to think twice about annuities is the hidden factor of inflation. Today it might seem like a good idea to purchase an annuity that pays $5,000 per month for the rest of your life. But in 30 years the same $5,000 may not go nearly as far as it does today because inflation erodes the purchasing power of money over time. Evaluate how much money you will really need to pay your bills not just this year and next year but perhaps in 20 or 30 years time too. Annuities often include terms and conditions that you should research before signing. For example, surrender charges may apply if you were to close your policy early. And in many (though not all) annuities you won’t benefit from investments that soar in value. By now you know an annuity is a type of insurance policy that pays out fixed premiums, but which annuity option is best? Annuities are famously hard to decipher when it comes to total fees charged. Clients usually receive thick booklets full of financial jargon and it can be challenging to find out precisely what you are paying in annuity fees and expenses. While your financial advisor should have your best interests at heart, it’s probably wise to compare the best annuity rates in order to create a shortlist of the best annuities for retirement before meeting with your advisor. When comparing annuities vs IRAs, you have lots of factors to consider but perhaps the most important of all is peace of mind. For seniors especially, the idea of running out of money later on in life can weigh heavily as a concern. While an annuity may be costly when it comes to fees and expenses, it can provide a certainty that is virtually unparalleled: a guaranteed payment for life. For younger individuals or those who can tolerate more risk and want greater control over how their retirement money is invested, IRA accounts offer tremendous flexibility. You are not restricted to investing in different types of stocks or bonds. Real estate and other asset classes are options too. Companies like Fundrise, Roofstock, and Rich Uncles all offer ways to gain exposure to real estate without getting your hands muddy with day-to-day management. What Are The Rules For Roth IRA Withdrawals? How Much Can I Contribute To A Roth IRA? Traditional IRA or Roth IRA? 401(k) or IRA: Which Is Better?